I can't believe we made it out alive. On day two of my vacation, Mom and I got a very early start and drove two and a half hours up to scenic Provincetown. I'd never been before, but Mom had many years ago and was looking forward to seeing it again. For those of you who haven't had the pleasure of seeing this beautiful town, I can sum it up in one word - frenzied. Not only were the one-way streets super skinny, but the tourists did not think anything of walking directly in front of an oncoming vehicle. Insanity! 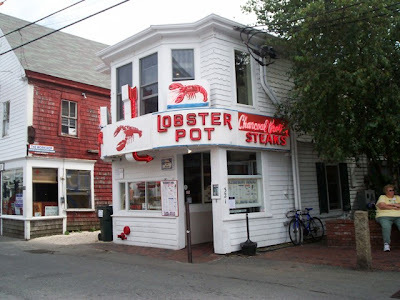 Since Mom and I wanted to have the whole Provincetown experience, we decided to visit the famous Lobster Pot, which has been featured in the Zagat Survey. After riding past this restaurant on a trolley tour and seeing a line of people waiting to get inside, Mom and I decided to do some shopping before heading in. We were finally able to enter at around 1:20 p.m.
What a chaotic environment! Mom and I had no idea what we were in for. We gave our names to the friendly hostess who told us that the wait would be about 10 minutes. It wasn't. There were about 900 tour group biddies that were making deals with the hostess about combining small parties to get faster seating - and it worked. They were seated quite a few minutes before Mom and I were, but the hostess assured us (and a few others that were in line) that the food would be worth the wait. Finally, our name was called and we were told to walk straight up the ramp and into the dining room where someone would seat us (there was also an upstairs area). We arrived at the ramp, but when we got there the host told us that our table was not yet ready. Another couple arrived behind us and was seated right away. Umm ... OK. We were there first, and like them, we had only two people to our party. Another small group came through and were seated before us. What was going on? As Mom and I watched out for passing servers with large drink trays and tried to figure out the complex seating arrangements, we were finally ushered by a very polite man in a Hawaiian shirt to a table by the windows. He had assured us that our table would be great, and it was. We faced the Provincetown Harbor and got to see all the boats docked against the pier. The host left us with two colorful menus, and Mom and I were delighted to finally be seated and one step closer to eating lunch. Unfortunately, Mom and I were left waiting. We had not been approached by any member of the waitstaff. Finally, after several minutes, a young lady came over. Her name was Leyla, and she seemed extremely busy (as did everyone else). She was very rushed in taking our order. Since we hadn't ordered drinks yet, we both asked for a Diet Pepsi. 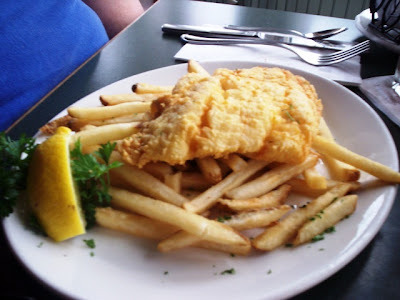 Mom then chose the fish and chips ($17), while I ordered the Alaskan King crabmeat salad roll ($14). I was on the fence about getting a cup of their famous clam chowder, but Leyla was so quick in taking our order that I kind of forgot about it. The Lobster Pot interior is really pretty. 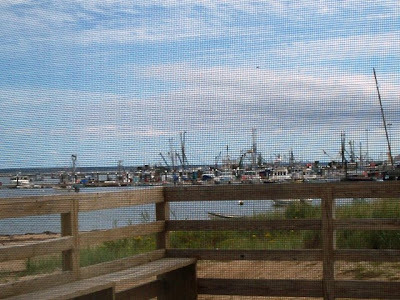 Although there were people everywhere, which made taking photos almost impossible, I was able to get a beautiful shot of Provincetown Harbor through our window. 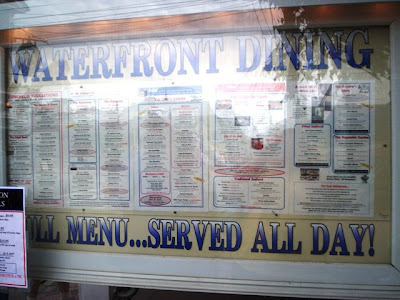 Old pictures of The Lobster Pot hang in the lobby, and merchandise with the Lobster Pot logo is sold throughout the restaurant. Lobster-shaped restaurant pagers that light up when a table is ready are handed out to customers. Curtains decorate the large windows while the warm beige wall color does its best to try and calm down the craziness of the restaurant. An extremely large lobster tank filled with live lobsters is located right by the door, and I saw several male employees jump up on the counter area to retrieve huge lobsters out of the tank. Poor things!!! I always feel bad for the lobsters. Pretty view from our table. A crappy shot of the dining room. And so we waited ... and waited ... and waited. Our drinks finally arrived, and were a bit watered down. Mom and I were just so thankful to finally be able to hydrate ourselves that we didn't care what the soda tasted like. We then resumed waiting ... and waiting ... and waiting. 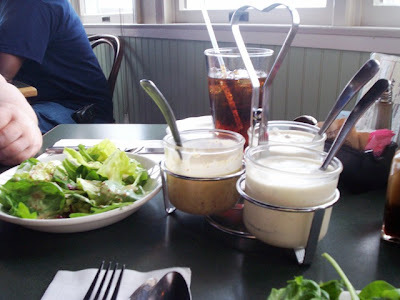 After a while, Leyla came to our table with a salad dressing compote with three homemade dressings - honey mustard, roasted garlic, and blue cheese. She placed a small plate of greens in front of Mom, who informed me that her meal came with a salad. She split the salad with me because I was famished. I tried the roasted garlic dressing while she had the honey mustard. Both were excellent. Leyla had also brought over a bottle of something else (I swear I heard the word sesame), but her words were lost amongst the loud diners. And so we waited ... and waited ... and waited. 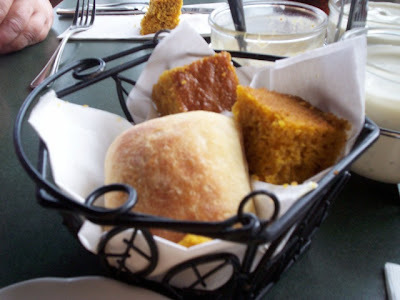 Leyla returned to our table again to bring over a basket of breads, which Mom said was also included with her meal. There were two sourdough rolls and four small squares of gingerbread. All were moist and tasted delicious. I told Mom that I was extremely glad that the salad and bread basket came with her meal, or I might have died of starvation. "I'm going to jump out of this window and drown myself." - Laura, after an hour of waiting. "I am so sick of getting felt up on your vacation." - Mom, who was groped by someone trying to slither around her seat. Perhaps the most exciting thing to happen between all the waiting. "I think our waitress quit." - Laura and Mom, who hadn't seen Leyla in about 30 minutes. "My stomach is eating its own lining." - Laura, who was slowly passing away. "I can't feel my legs." - Mom, after sitting in the same position for over an hour. "I don't want to have a meltdown." - Laura, who was having a meltdown. "I'm going to flip this table over." - Mom, who was on the verge of having a meltdown. I know what you're thinking, and that's too bad. We don't like waiting, and we've never had to wait over an hour for a fish and chip dinner and some crab salad in a hot dog bun. Mom and I eventually came to the conclusion that it was our waitress that was holding us up. The people who were seated directly behind us had not received their food, either - and they had the same waitress as we did. Unfortunately, they came in almost immediately after we did so we knew that they had been sitting for quite a while. Plus, they had a small baby with them. We were lucky that the little kid didn't shut the place down by throwing a hissy fit. FINALLY, after over an hour of waiting, our food arrived. Both plates looked great, although I thought Mom's fish was a little on the skimpy side. 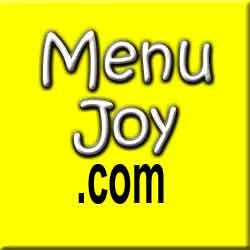 She said that the fish itself was excellent. It was very white, flaky, and perfectly done. Her only complaint was that she wished there was more of it. It was a very thin piece and not particularly long. Mom was only grateful that the crust was nice and light because at least she was able to taste the fish. They made up for the lack of fish with a massive amount of fries, which arrived a little on the luke warm side. Mom had a feeling that the fries had been sitting around a while, waiting to be picked up. They were just OK. Her dish also came with a side of tartar sauce and ketchup. My crabmeat salad roll was fresh and tasty. I never had crabmeat salad before and was a bit nervous to try it. I enjoy crab, but only mixed in with other things. This roll was packed with meat and was crunchy (was it supposed to be?) and hearty. It was accompanied by a slice of tomato and a scoop of potato salad which had an excellent taste. I would highly recommend this dish to any crab lover, but I'm not sure if I was ready for all that crab at once. This is purely my personal preference and has absolutely nothing to do with the delicious roll, which I ate every bit of. It was quite good. All in all, we think the prices were a little expensive, but it's hard to price seafood because the market fluctuates daily. I do think that Mom could have had a bit more fish on her plate for $17. We ended up leaving $45 for Leyla, which was a $1 less than a 20% tip. I was going to leave less because the service was ridiculously slow, but I just wanted to get the heck out of there and didn't want to stick around to wait for change. In her defense, perhaps she was a new employee. 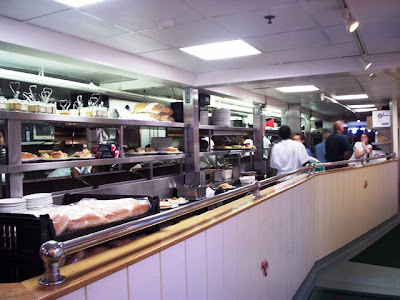 However, she has to learn to speed up the service, especially in a busy place like The Lobster Pot. Mom and I tried using the restroom, but there was someone inside and a line waiting to get in. We opted to use the public ones by the pier instead. We finally left the building at just about 3 p.m.
Phew. I'm tired just from reliving this experience. 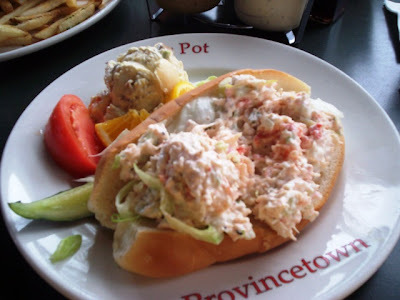 I'm very glad we visited The Lobster Pot because it is a Provincetown staple. However, I don't think we need to go back on our next visit. 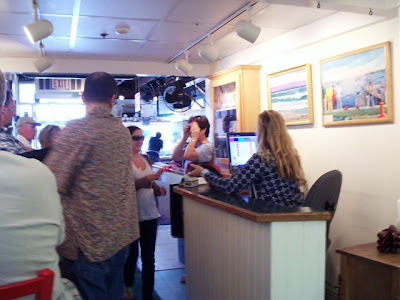 Perhaps we'll revisit on a less crowded day, but when isn't Provincetown crowded? I can't even imagine how busy this restaurant must get in the summer. To sum up our visit, the food was good, but the chaotic atmosphere was a bit much for us. I'm just glad we got out alive. Too bad I can't say the same for all those lobsters! 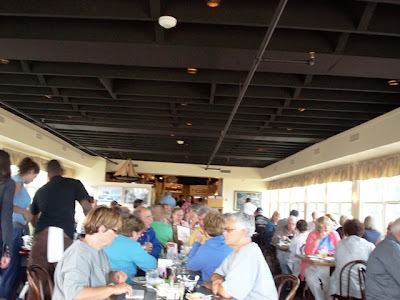 The Lobster Pot is open from 11:30 a.m. to 9 p.m. daily from the beginning of April to the end of November.